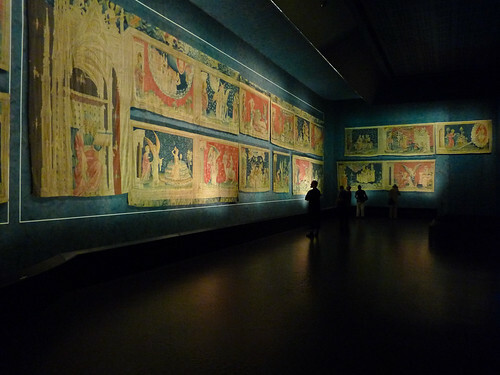 The Apocalypse Tapestry in the Castle in the town of Angers (chateau d'Angers), France is the World's longest tapestry. 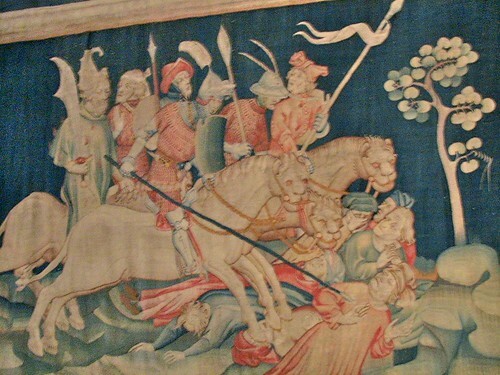 The tapestry was originally 140 metres (459 feet) long out of which only 100 metre (328 feet) has survived today. During the French Revolution, it was cut into several pieces and distributed to many persons for safekeeping. Towards the middle of nineteenth century the scattered pieces were gathered back and restored in the Cathedral. 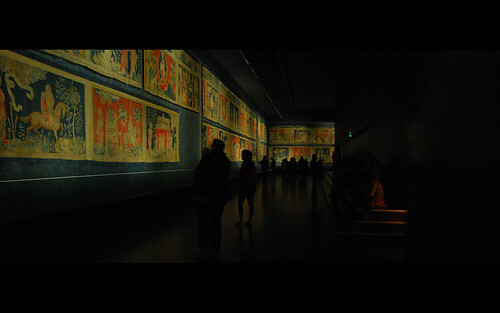 However 16 pieces (about 40 metres) were lost forever and the tapestry is now only 100 metre (328 feet) long. The restored work was shifted in 1956 to its original home chateau d'Angers where it is on display in a long gallery specially created for it. The tapestry which was woven from vegetable dyed wool is reversible i.e. its back is identical to the front side, also suffered decay due to exposure to bright light which has faded some of the dyed wool. The gallery where it is housed is now heavily curtained and dimly lit to prevent further damage to vegetable colours. Details of the stories depicted in various panels can be seen in the French Wikipedia (English Translation). Looking for maps, pictures and interesting stories for my new post, I found yours. I love maps, cartography. But I like the stories of remote sites, residents who do not live near you, other neighboring countries. I like the pictures say more than it seems. I like the geography of things, "the art of the earth", the images of casual living. Life without glasses. Your site is great to imagine this world. The world to come. The small event. I think I found a good blog. Thank you and good luck. A greeting from Barcelona. Greetings from Lucknow, India and thank you for your comments. I am happy that you liked my blog. For me the whole World is a big global village and most of its residents are neighbours - just one click away! Do keep visiting. Thanks once again.